Just because they call Cornelius Carradine “Tank” doesn’t mean the big defensive end is indestructible. The former Florida State standout, the 40th overall selection of the recent NFL draft by San Francisco, won’t take part in on-the-field activities for the 49ers this weekend when the team’s three-day rookie camp gets under way. But he’ll be there with all his classmates anyway, going to group meetings, learning the playbook and getting to meet the team’s coaches and his new teammates. Carradine, 6-foot-4 and 276 pounds, had surgery to repair a torn ACL suffered during a Seminoles game in late November. He hasn’t yet been cleared for on-field football activities and contact, but showed he’s well on the way back to being fit by running a 4.75 40-yard dash leading up to the NFL draft. It’s expected that Carradine will be ready by the start of training camp. Before his final season at Florida State was cut short, Carradine was proving himself as one of the best defensive ends in the nation. In 11 games he had 11 sacks, 13 tackles for loss and 80 tackles. 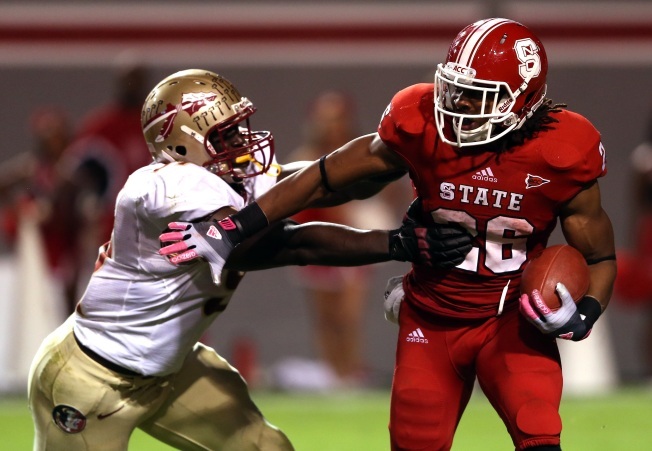 In 25 career games at FSU he made 11 starts, had 16½ sacks and 118 tackles. It’s expected that Carradine will provide backup for right defensive end Justin Smith this season, and could be an eventual starter. Last season, the 49ers’ defensive front of Smith, Isaac Sopoaga and Ray McDonald played the majority of snaps and appeared to wear down as the season progressed. Carradine could give the Niners much more flexibility. Fifth-round pick Quinton Dial of Alabama, who will be at this weekend’s rookie camp, already has signed a four-year deal with San Francisco. Dial, Carradine and free-agent pickup Glenn Dorsey figure to be contributors on the D-line. It’s Carradine, however, who might make the biggest impact. He can get after the quarterback.